In 1973, both Britain and America were experiencing one of the worst years since the end of World War II. The Vietnam War still raged, while the civil rights movement continued to fight for equality and an end to the racial discrimination that blighted America. To add to America’s woes, the Watergate investigation continued, that led to the resignation of President Richard Nixon on August the ‘9th” 1974. Meanwhile, 1973 started badly when Conservative Prime Minister Edward Heath took Britain into the EEC in January 1973. This the Europhile Prime Minister claimed was the finest moment of his career. However, Britain joining the EEC was much to the chagrin of many politicians and voters. The British public were denied a vote until the 7th’ 1975, when they voted to remain members of the EEC. Meanwhile, Britain was facing yet another crisis. This was nothing new, during a four-year long depression. By October 1973, there was a Three Day Week in Britain, after the Conservative government limited pay rises. This resulted in a miners strike. The miners had threatened to strike in early 1972, and were awarded a pay rise. In doing, so this meant that the three-day week Prime Minister Edward Heath threatened to introduce in manufacturing and industry to hold onto Britain’s energy reserves was averted. While what many business leaders and politicians were relieved, others realised that Edward Heath had given into the union barons, who would be back for more. And so it proved to be, after the miners slipped from the top of the industrial league to eighteenth. By then, civil servants, medical staff, railway and dock workers were on strike, and the miners withdrew their labour again. The superannuated union barons were causing chaos, and on New Year’s Day 1974 the three-day week began. It lasted until the ‘7th’ of March 1974, and for that period, there were power cuts and blackouts in houses across Britain. Suddenly, the demand for candles and torches was on the rise. Even television was affected and the three channels closed down at 10:30 pm, and many people decided to have an early night. Nine months later, and nurses and doctors noticed that there was spike in the birth rate. Much has been written and said about the three-day week, but it has never inspired a compilation. That is until recently when Ace Records released Three Day Week-When The Lights Went Out 1972-1975. It’s lovingly compiled compilation that features twenty-six eclectic tracks. The Strawbs open Three Day Week-When The Lights Went Out 1972-1975, with Part Of The Union which is tinged with a sense of ambivalence. This must have struck a nerve with many people as the single arched number two in Britain. Small Wonder contributed the rocky Ordinary Boy, while The Kinks’ When Work Is Over and The Sutherland Bros Band are both welcome additions. Despite the inspiration for the compilation, there aren’t many overtly political songs. The exceptions are Phil Cordell’s Londonderry, the Edgar Broughton Band’s Homes Fit For Heroes and Pheon Bear’s War Against War, which was released in 1973, but sounds as of it’s from the early sixties folk boom. There’s a number of familiar faces on Three Day Week-When The Lights Went Out 1972-1975 including The Troggs’ who contribute I’m On Fire. It’s joined by Mungo Jerry’s Open Up, Hawkwind’s Urban Guerilla and What Ruthy Said by Cockney Rebel. Other songs tap into the feelings of the time, ranging from a sense of despair and helplessness to irreverence like Lieutenant Pigeon’s And The Fun Goes On. It’s joined by Robin Goodfellow’s Why Am I Waiting which features a vocal filled of frustration. Climax Chicago’s Mole On The Dole and I Feel So Down by Barracuda will bring back memories of what it was like to live through this time. Very different is the Northern Soul Dance from Wigan’s Ovation. This was a private press released in 1975, at the height of the Northern Soul boom. Closing Three Day Week-When The Lights Went Out 1972-1975 is Stardust by Davis Essex. It’s the title-track from the 1974 film, which was the followup to That’ll Be The Day, which features the further adventures of Jim Maclaine and had the ts tagline: “Show me a boy who never wanted to be a rock star and I’ll show you a liar.” It was the perfect antidote to what was a depressing time for many British people. 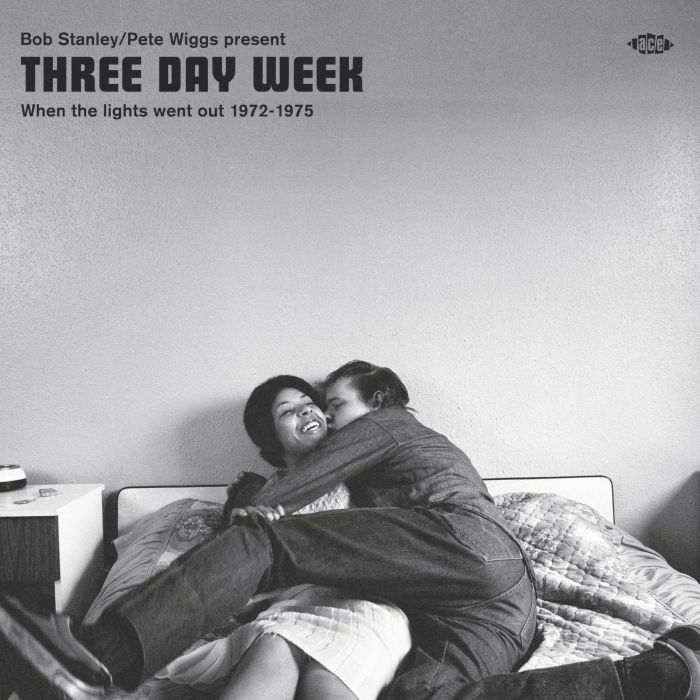 Three Day Week-When The Lights Went Out 1972-1975 which was compiled for Ace Records by Bob Stanley and Pete Wiggs of Saint Etienne. This is the latest lovingly curated and eclectic compilation that takes as its inspiration events in recent history in Britain, America and France. The period Three Day Week-When The Lights Went Out 1972-1975 covers, saw Britain lurch from one political crisis to another. This included the three day week which is wrongly romanticised. Britain was teetering on the brink, as strikes caused chaos and unemployment and inflation rose. However, still British artists and bands continued to create some of the best music being released between 1972 and 1975. British bands like Led Zeppelin, Black Sabbath, Deep Purple as Genesis,enjoyed commercial success in North America, as rock and progressive bands flew the flag for British music. They were amongst the biggest and most successful British bands, That was just part of the story of British music during this period, and as Three Day Week-When The Lights Went Out 1972-1975 shows while Britain teetered on the brink, the music scene was thriving vibrant and eclectic during what was a golden period. ← ROGER WATERS-THE SOLO YEARS.